Welcome　to Guesthouse Kanoka website. Open from April 2015, Guesthouse Kanoka is located in Northern Shinshu (Nagano prefecture) and is surrounded by fruit fields and the region’s praised natural beauty. Natural choice for people wanting to visit the surrounding mountains, it welcomes single travelers as well as couples and other groups. The guesthouse reflects the surrounding nature with wooden interior and big windows in a clean and modern way. Rooms are available in Japanese style or Western style and come with air conditioning and heating. Shared bathroom facilities. Free Wi-Fi available. Guests can make a visit to the Jigokudani Snow Monkey Park with a 30-minute bus ride or a 15-minute drive. 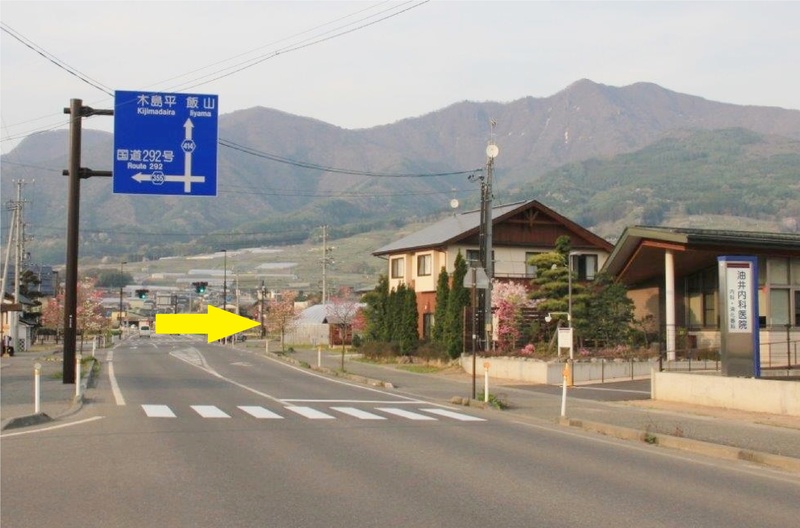 Free parking and pick up service(Shinshunakano railway station) is available upon request.We assist guests with planning sightseeing around the area including fruit picking, winter sports depending on the season. We have Japanese－style rooms, Western-style rooms and Dormitory-style rooms.All rooms with air conditioner. Dormitory room separated Male guest bed room and Female guest bed room . 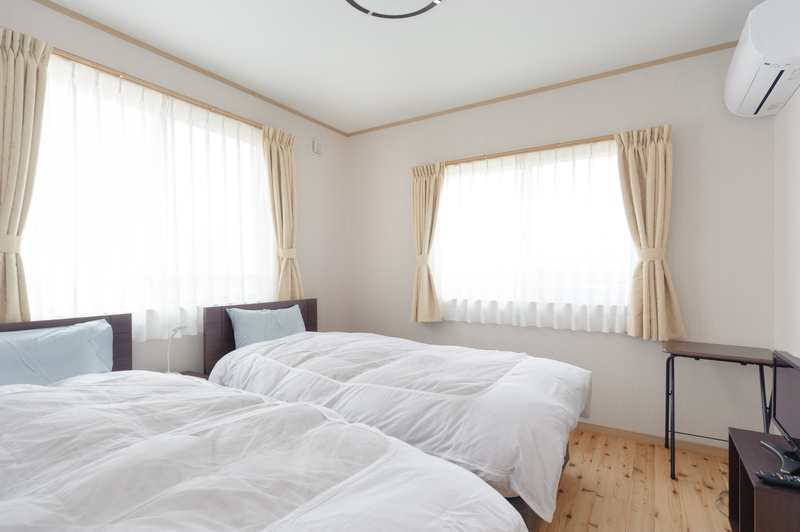 #Twin bed room and Japanese style(Tatami and Futon) rooms include fee face towel and rental bath towel . 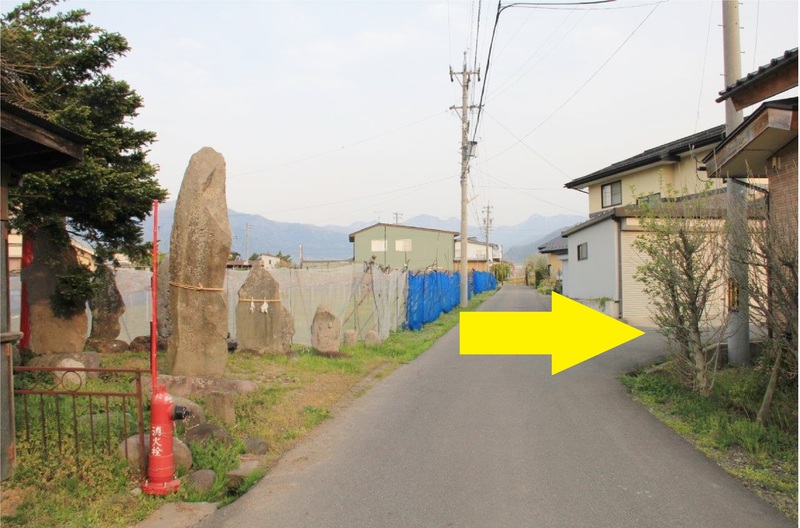 ○Guest must leave the property between 10:00-16:00 due to daily cleaning of the property. Please make a reservation on online reservation site.  Multiple trains available from Tokyo, Osaka, Kyoto, Nagoya Kanazawa etc to Nagano station. It take about 8 min by car or bus. We can pick you up from Shinshunakano station by praivate car, after 19:00. Please request pick up time on that very day by telephone. 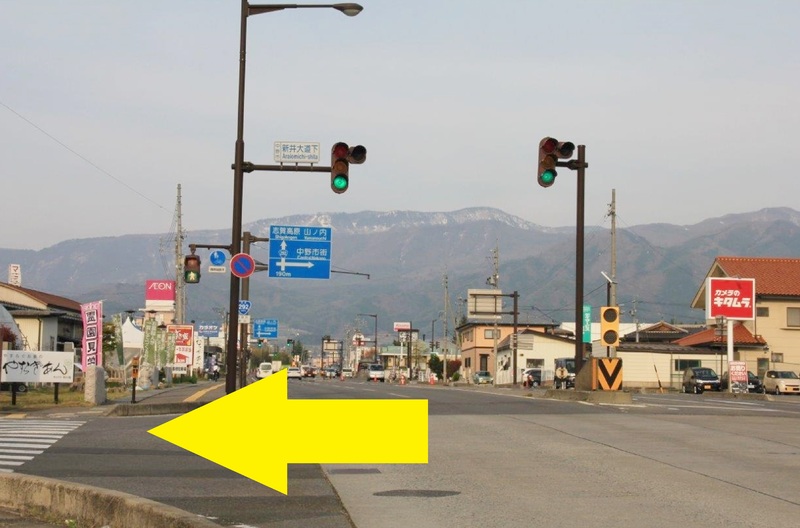 Any other time, it takes about 8 minute to Kanai bus stop by bus(bound for Iiyama station, kijima line),and 2 minute on foot.When you depart, we will take you to the train station. From Tokyo within 3 hours, from Nagoya within 3.5 hours. Nearest interchange:Joshinetsu Expressway Shinshunakano Interchange, 11 minute(8km)from Shinshunakano Interchange to our guesthouse. 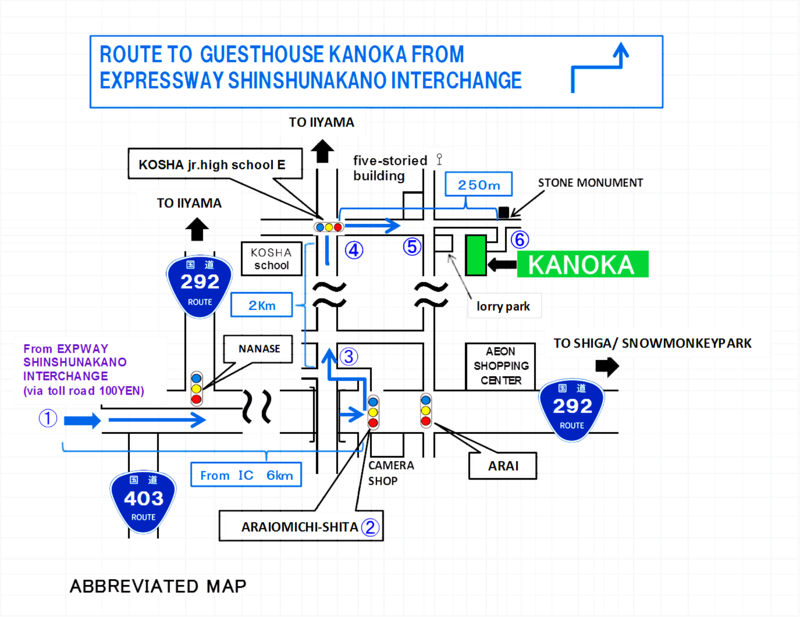 ①SHINSHUNAKANO　Interchange. Keep going straight at this intersection. 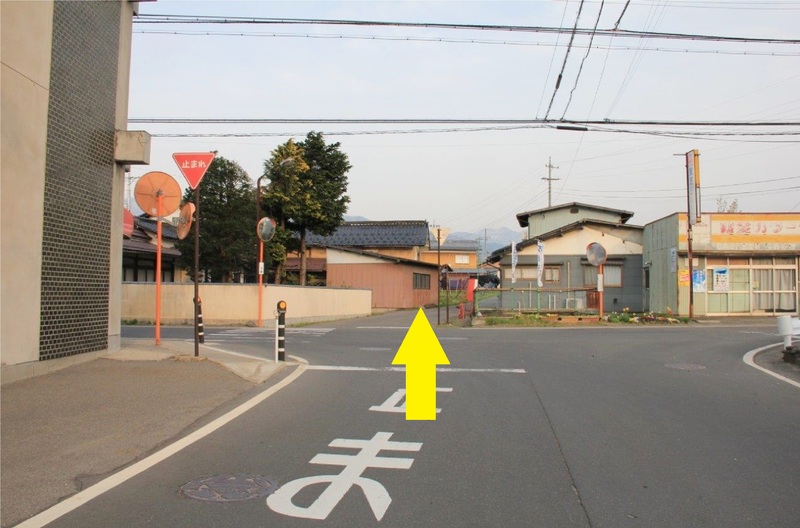 ②"ARAIOMICHI-SHITA"　Turn left at the intersection. ③Make a right at the intersection. 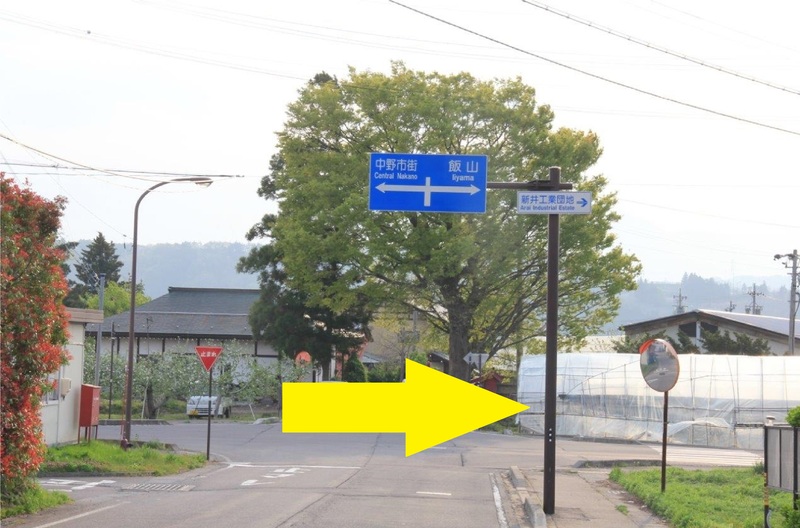 ④”KOSHA JｒHIGHSCOOL E” Make a right at the intersection. ⑤Keep going straight at this intersection. ⑥Make a right at STONEMONUMENT. Guesthouse back from the alley. Copyright Guesthouse Kanoka, All rights reserved.